Ridgeback Motion with red Speedhub on the Water Rail Way between Lincoln and Boston August 2018. 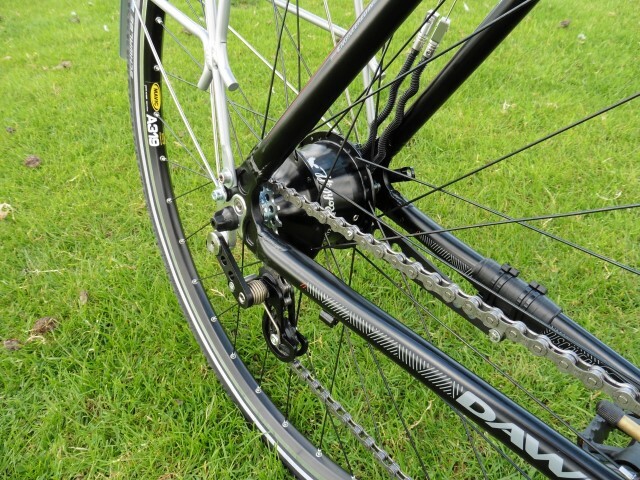 …are you tired of crunching the chain and sprockets on your bicycle when changing to a different gear? …are you sick of having to mess around lifting your bike up and pedalling by hand when you find yourself in the wrong gear before you start off? …are you finding yourself clicking twice on the left lever and 4 times on the right then hoping it is the gear you want? 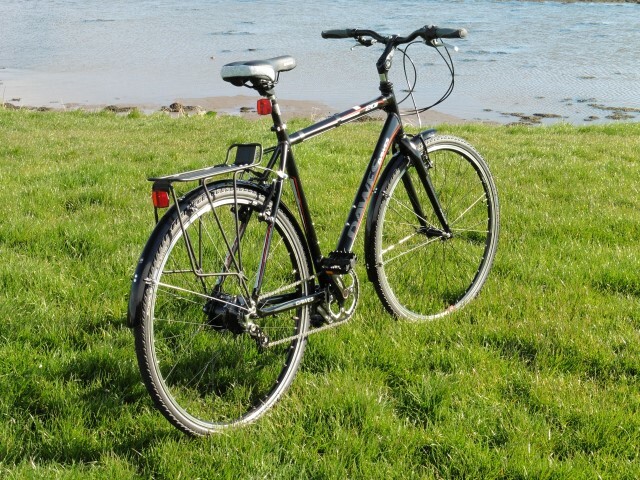 A bike with hub gears will allow you to change gear whilst standing still and the sequential change allows the correct ratio to be found easily. Many of the bikes currently available that are fitted with the Rohloff Speedhub 500/14 have been built using frames made specifically for this gear system. These frames are of excellent quality and come equipped with high end components. This is why they usually have a high price attached. For some people, this means they are beyond sensible budget. To offer the Rohloff experience to a greater audience, we take a good quality but relatively inexpensive ‘off the shelf‘ bicycle, strip it of derailleur gears then install the 14 speed hub gear system. Our prices start from as little as £1799. 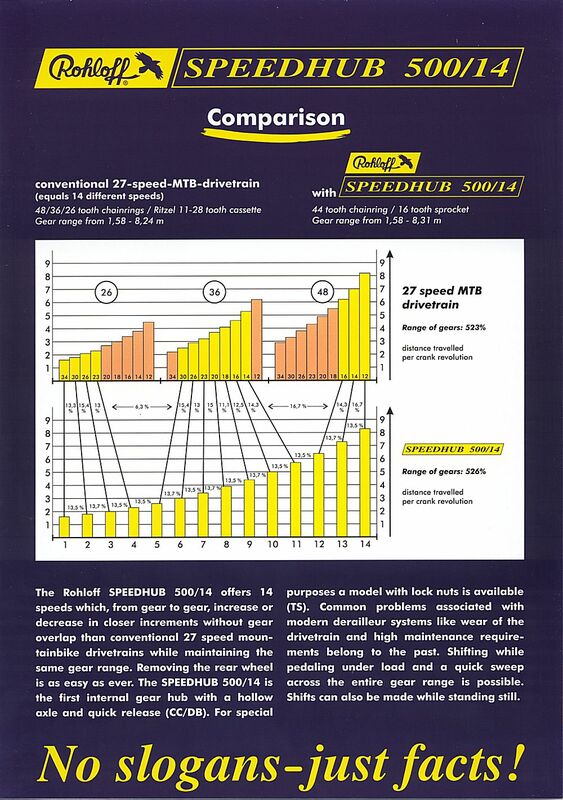 Why choose a bike fitted with a Rohloff Speedhub? Go to www.rohloff.de for all the information you will need about it…………..
My name is Norman Gauld. I have worked in the bike trade for over 25 years, mostly within independent shops but also in chain stores with bike departments. I have been engaged in all aspects of work within these environments, especially the assembly, servicing and repair of all types of pedal bicycle including electrically assisted. I have long had an interest in hub geared bicycles and believe them to be superior to derailleur geared bikes in many ways, especially for those who use their bicycles for utility or touring purposes, or simply for the pleasure of riding a bike. 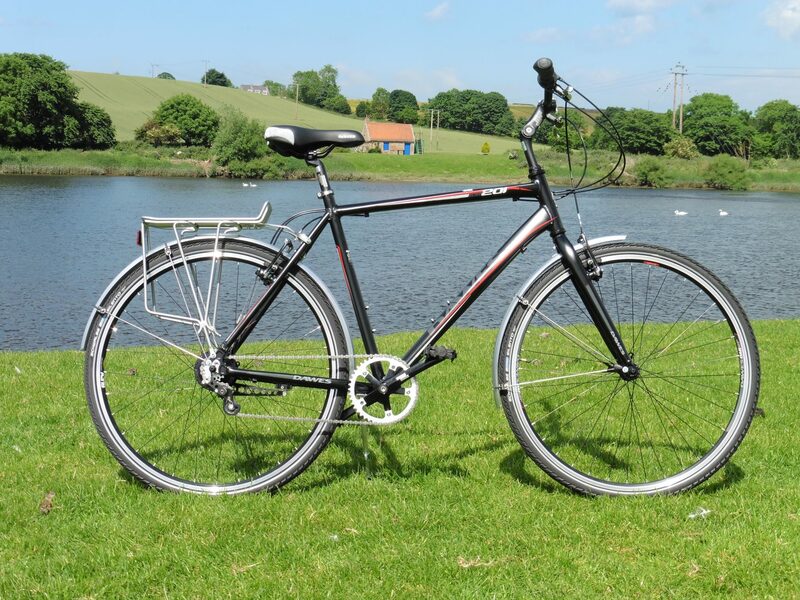 Using the knowledge and experience gained over my time in the trade, my team and I are able to offer a Rohloff geared bicycle for a price which you may find is a surprising amount less than many others are asking. 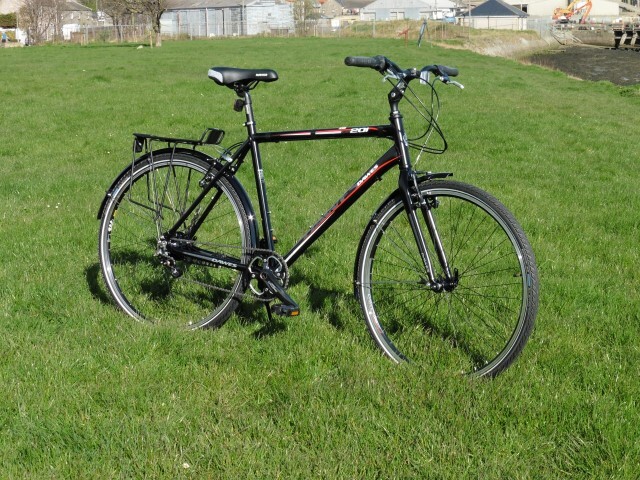 The assembly is done carefully to a high standard, then the bicycle is taken for a 20 mile test ride. Any adjustment needed to ensure correct operation is made. Only then is the bike available to the customer. How we keep the prices reasonable. 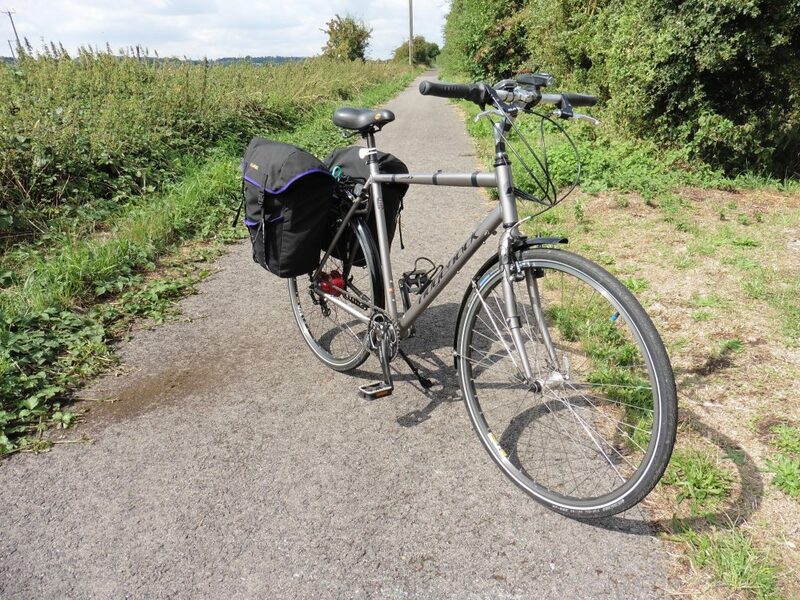 The bikes we assemble are of good quality but with ‘middle of the road’ specification. We don’t use overly expensive, fancy parts. Just good, solid, workable bits. The other components the bikes are fitted with will function efficiently and reliably provided the bike is used sympathetically for its intended use. All bits are readily available when they eventually wear out. 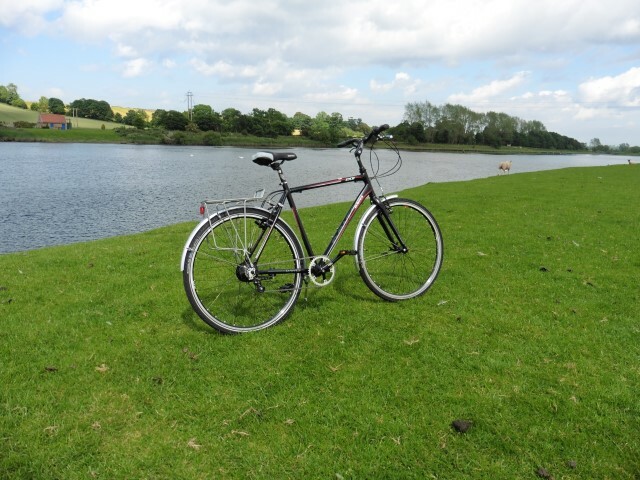 We tend to put the Speedhub into hybrid bikes as they are quite adaptable and can be used as commuter bikes, tourers or ‘cycle around the countryside for fun’ bikes. Occasionally, a hardtail Mountain Bike will get a Speedhub fitted though. Different brands of bike are used in our creations but only those which have good quality frames suitable for Rohloff fitment. Some of the original components fitted to these frames are retained, but there are others that need changing to ensure that the completed bicycle works correctly. Check out the ‘Rohloff Bikes’ page to see if anything there is of interest to you. Get in touch with us via the ‘Contact Us’ page and we’ll arrange to phone you and have a chat about what you want. If we don’t have a bike that suits and you want us to create one for you, we’ll work out what is right for you then start ordering up any components we don’t have in stock. As long as our suppliers have the stuff we need, we usually manage to have a finished bike ready within 3 weeks, often quicker. We don’t do mail order or online sales so you’ll need to come and see us to pay and collect your bicycle in person. That way, we are both sure it is 100% correctly assembled and fitted for size. There is a selection of quiet country roads on our doorstep so you may take your new bicycle on a test ride to familiarize yourself with it. Any issues of fit can be addressed immediately upon your return. We can also give you practical advice and demonstrations on how to look after your new acquisition to give it a long and reliable service life. Does fitting a Rohloff Speedhub make a bike heavier? Does it have a wide range of gear ratios? It’s wider than on most other bikes and, quite frankly, it’s as wide as any bicycle gear system needs to be. Have a look at the table at the bottom of the page. 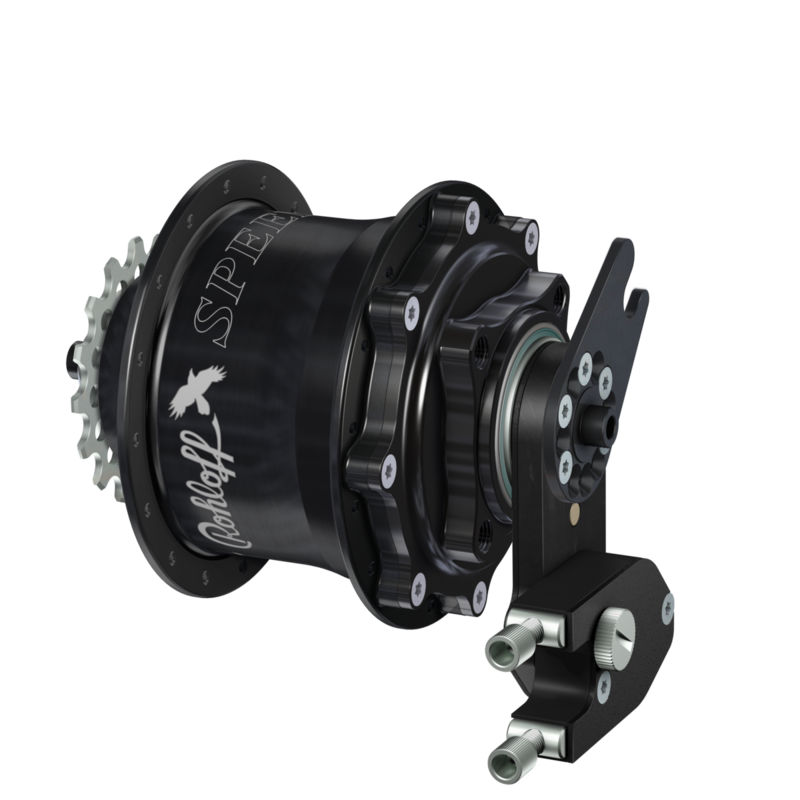 Will a Speedhub fit any type of frame? 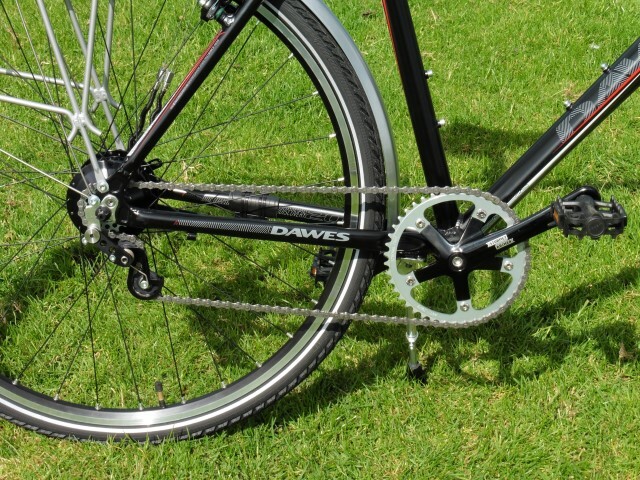 Why do the pictures show a derailleur fitted? It’s not a derailleur. It’s a chain tensioner. 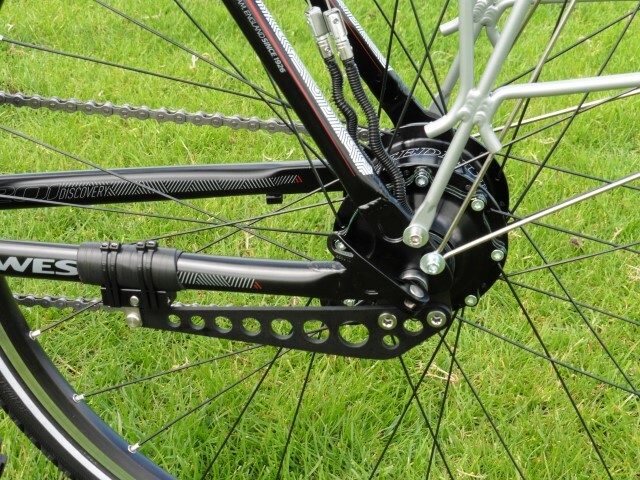 Some bicycles such as fixed wheel bikes, single speed bikes and hub gear bikes are fitted with one sprocket at the front and one at the back. The frames of these bikes are usually fitted with either track ends, horizontal dropouts, sliding dropouts or eccentric bottom bracket shells. All of these allow correct tensioning of the chain and work very well as long as the user or service person knows what they are doing. A chain that is too slack may easily jump off the sprockets causing damage to the bicycle and possible injury to the rider. 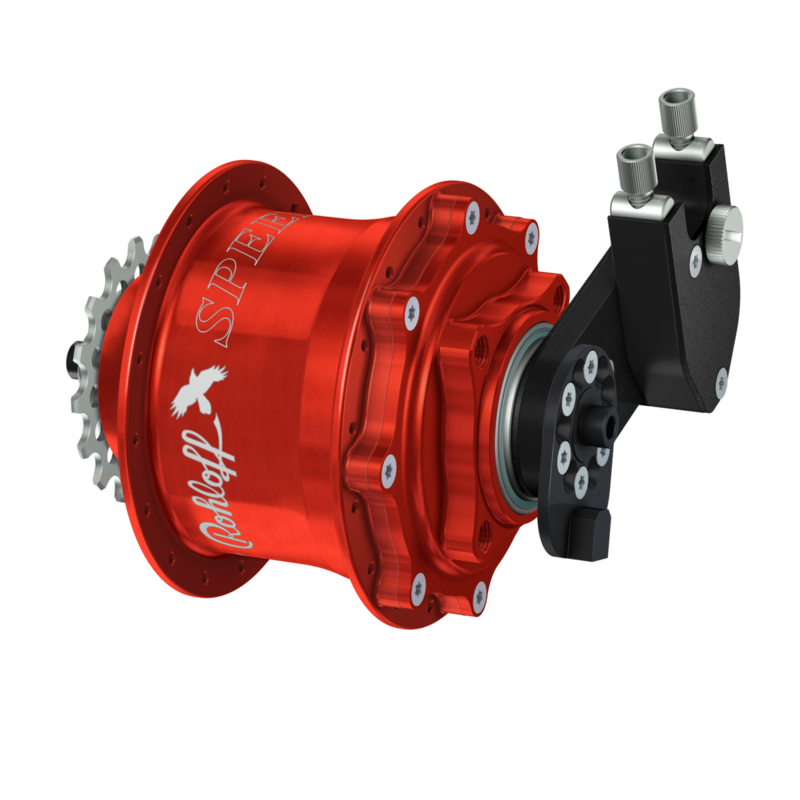 A chain that is too tight will cause excessive wear on itself and the sprockets due to high friction when pedalling and more importantly, will overload the bearings in the bottom bracket or the hub itself. Overloading the bearings in a hub gear will lead to a failure which may be quite expensive to rectify. The frames we tend to use have vertical dropouts and a derailleur hanger. As this set up has no facility for adjusting the chain, it is necessary to fit a chain tensioner, which has the happy side effect of preventing the above mentioned problems. In my time in the trade, I have come across a few bikes with destroyed hub bearings due to incorrect initial set up and/or poor servicing by persons not familiar with hub gears. Will you supply me with a Rohloff rear wheel only? No. There are far too many variables involved. 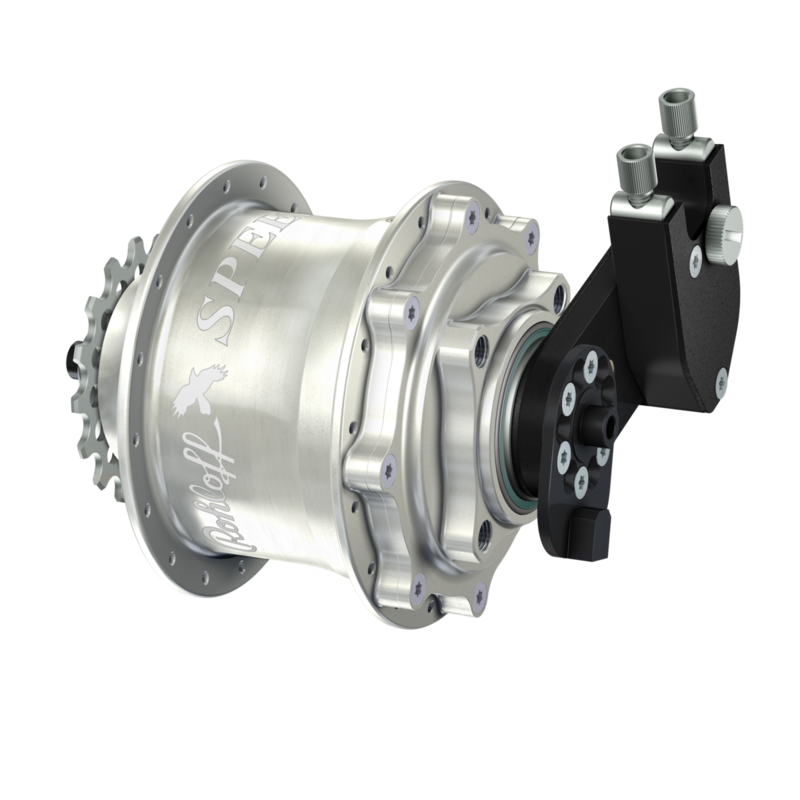 If I were to build and supply you with just a wheel, I could never be sure if it has the correct Speedhub version or indeed, if it will fit the frame you want it for. The only exception to this is if you were to get the frame to me and I decide it is suitable. If you have any questions, please feel free to ask using the “contact us” form.